Republican frontrunner Donald Trump will hold a surprise 7:00 p.m. rally tonight at the Infinity Event Center in Salt Lake City, Utah, his campaign confirms to Breitbart News. The rally will be held Friday, at 7 p.m., despite threats from local left-wing activists to disrupt the event. Donald Trump protesters whose plans were dashed when the GOP scrapped a Salt Lake City debate may still get their chance Friday night, when the Republican favorite is expected to host a rally at the state Fairpark. Ian Decker, an organizer with the University of Utah’s Students for a Democratic Society chapter, said his group had planned to demonstrate even in the absence of a Trump appearance. Now that Trump again appears valley-bound, “it’s crunch time,” Decker said. As of Thursday evening, more than 700 people had committed via Facebook to attending the group’s 8 p.m. [some reports say 6 p.m.] gathering at the intersection of 200 North and 900 West. Decker said he hoped for a large contingent that would then walk about a block to the rally and be very loud, refusing to leave. “Our resolution is that he should be afraid to go to the city,” Decker said. Though the Trump campaign never publicly confirmed the Utah State Fair Park venue originally reported as the rally venue, the apparent switch to the more secure Infinity Event Center is an indication that the campaign is taking precautions against the possibility that the protesters might resort to threats of violence. Last Friday, Trump canceled a rally in Chicago when the event was attended by thousands of organized far-left protesters, some of whom indicated an intent to use violence. Though there were incidents of violence at that canceled event, but no serious injuries occurred. 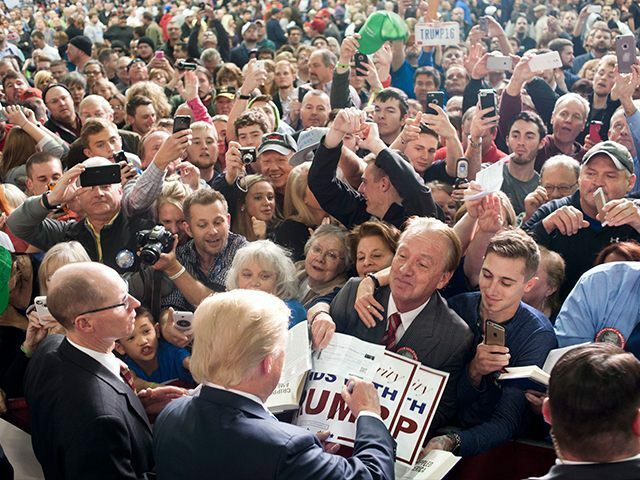 Trump’s decision to hold a rally in Utah just days in advance of next Tuesday’s GOP majority-take-all caucuses there is an indication that he does not intend to concede any of the state’s 40 delegates to his main rival for the GOP Presidential nomination, Sen. Ted Cruz. Though the most recent Utah GOP poll was taken in February before Sen. Marco Rubio dropped out of the race, it showed Cruz ahead of Trump by several points. Cruz is considered the favorite in the state with its 55 percent Mormon population, the support of Mormon talk show host Glenn Beck, and the recent endorsement of Sen. Mike Lee. Trump could have focused all his efforts on Arizona, which holds a winner-take-all primary on the same day. He leads Cruz by double digits there in a March 8 poll, and a victory there would guarantee him all of the state’s 58 delegates. Instead, Trump is rolling the dice and betting that his appearance tonight, combined with Gov. John Kasich’s aggressive campaigning in Utah, will limit Cruz to less than 50 percent of the caucus vote. Cruz, for his part, is betting that he can win 50 percent plus one and secure all 40 of the state’s delegates. If Trump and Kasich combine to win 50 percent plus one of the caucus vote, Cruz would get a proportional allocation of the 40 delegates that he would share with Trump and Kasich, provided they each clear the 15 percent vote threshold. Trump is also betting that any protests planned against him will be contained and not turn violent. Should violence take place, the mainstream media undoubtedly will blame Trump for it, regardless of the facts, just as it tried to do last week in Chicago. Some of his rivals may also try to place all or some of the blame on him should violence break out. How that will play out electorally, however, remains to be seen.